Last week, I joined the Western Fire Chiefs Association and public safety officials for a site visit to the burn area of the Camp Fire in northern California. This trip was an opportunity for the First Responder Network Authority (FirstNet Authority) to learn about the public safety response to the fires that devastated Paradise, California—a town of 27,000 residents in the foothills East of Chico—directly from those fire chiefs and other first responders who were on the ground during the wildfire. Not only did seeing the Camp Fire site leave a lasting and tremendous impression on me, it also helped provide perspective on the enormity of the more than 153,000 acres of destruction and devastation to impact Butte County last November. Everything in view was affected by the fire. While visiting the burn area with several fire chiefs from across the West, first responders told us about the series of unfortunate circumstances surrounding the fires, including drought conditions, brush-covered rural terrain and fast-moving wind gusts. These conditions set the stage for an incredibly fast-moving wildfire—on November 8th alone, more than 15 square miles burned in a little over an hour and a half. The response to this wildfire showed the realities facing smaller, more remote communities that rely on mostly volunteer fire services, as well as the importance of mutual aid agreements with neighboring states and communities to share resources during large-scale disasters. The fast changing environment of the Camp Fire also provided an extreme challenge—the fire line was unpredictable, jumping erratically with the high winds, making real-time information scarce for both firefighters and residents. For any disaster, community preparedness and effective communications are critical to response, rescue, and recovery efforts. During the Camp Fire, most of the communications and critical infrastructure were damaged. To provide first responders with connectivity, FirstNet responded with dedicated deployable assets like Satellite Cell on Light Trucks (SatCOLTs). During our planning for the nationwide public safety broadband network, public safety told us they needed deployable assets, and today these dedicated assets have been used to support FirstNet public safety subscribers across the country. 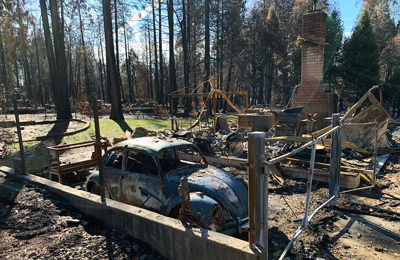 Seeing the dramatic impact the Camp Fire had on people’s lives and the great lengths that our first responders go to protect their community—it shows the continued need for FirstNet and why the FirstNet Authority will continue to ensure the network delivers for public safety and helps make communities safer and more resilient. I’d like to thank all the first responders who responded to the Camp Fire and continue to serve their community in its time of need, especially Butte County Fire Chief David Hawks for hosting us on this visit. Thank you also to the Western Fire Chiefs Association for organizing this site visit and inviting me—hearing from local first responders is invaluable as we grow and evolve the FirstNet solution to meet their needs.